Direct Beach Front, one of only fourteen units this close to the ocean in Ko Olina. Located at Ko Olina's 2nd Beach Lagoon. Furnished beautifully with 1 King bed and 2 Extra Long Twin beds that can be converted to a King bed. There is also a new Sofabed in the Living Room. Attention to detail is evident with Panoramic Ocean views. Beautiful, fully equipped Gourmet Kitchen. Adjoining Unit #610, can also be rented and the two units become ideal for larger families or group functions such as weddings. Gated Secure Building, Elevators, FREE High-Speed Internet Access, Phone/Answering Machine, Air Conditioning, Ceiling Fans, Flat Screen HD TVs, DVD Players, Full Kitchen, Microwave, Refrigerator, Dishwasher, Wine Fridge, Cooking Utensils provided, Linens provided, Washer & Dryer, Towels, Pools & Jacuzzis (shared), nearby Disney Au'lani Resort & Spa, or the new Four Seasons for massage treatments and pampering. Choose to spend your days on the Ko Olina Championship golf course or at the Marina; relax at one of four breathtaking sandy lagoons,spoil the kids at Au'lani Disney Resort or explore the rich culture and beauty of the Island. Enjoy breath-taking sunsets, experience an authentic Hawaiian luau, a barbeque by the pool or a relaxing evening stroll through beautiful Ko Olina. 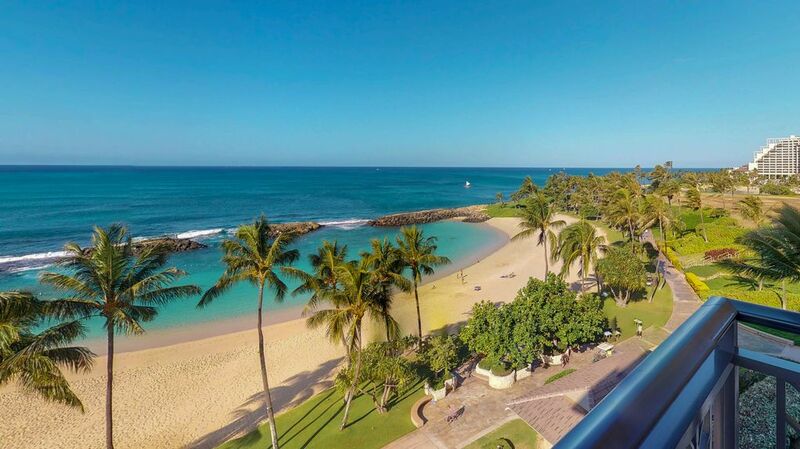 World-class restaurants and nightlife are only minutes away in the laid-back, serene atmosphere of Ko Olina - or experience all the excitement of city life with a drive to Honolulu. Public transportation and limousine service are both available from Ko Olina. Activities: Ko Olina Marina; 18-Hole Ted Robinson Championship Ko Olina Golf Course; Award-Winning Marriott Ihilani full service Spa, the newly opened Disney Aulani, the Paradise Cove Luau, shopping, snorkeling, SCUBA diving, boating, fishing, sailing, surfing, windsurfing, walking and hiking paths; guided activities, including whale watching and dolphin swims as well as scenic island tours. Area: This romantic yet family-friendly resort is located just 20 to 30 minutes from Honolulu International Airport, world-famous Waikiki, downtown Honolulu, Pearl Harbor, Waikele Premium Outlets and other attractions such as Historic Ewa Town, Hawaii's Plantation Village, and Dole Cannery. Breath-taking Hanauma Bay is a 45 minute drive with Sea Life Park a short 5 minutes further. The Polynesian Cultural Center is well worth the hour's drive and you'll experience many traditional must-sees along the way - such as the historic surfing town of Haleiwa, and Hawaii's infamous North Shore Beaches such as Sunset, Pipeline and Turtle Beach to name a few. The resort itself is home to the island's best and most authentic luau - Paradise Cove. Hawaiian Waters Adventure Park; Kapolei's 16-plex movie theater, and shopping at K-Mart, Wal-Mart, Target, Safeway and Costco for souvenirs and all your needs is a short drive. toilet, combination tub/shower, This Guest Bathroom comes with a tub/shower combination. The bathrooms are accented with beautiful dark-wood cabinets and modern fixtures. Having a direct view of the ocean and cove makes this condo special! We spent every morning and evening on the lanai enjoying the view and relaxing. Easy access to H1 and many options for dining. Two pools and several hot tubs, and a poolside bar for snacks and drinks. Had an amazing time. Highly recommend. We're so glad you enjoyed your stay with us on Oahu and look forward to having you back next time! Please let us know anything you need! Amazing view. Beautiful unit and property. Very good for small children. The perfect vacation with toddlers. Fun pools and safe beach. Great walkability. Live music at beach bar 2x/week and kids were dancing. Less crazy than Disney, nicer units and view for better price. This unit has an amazing view. Having it handled by Ola properties was seamless. Had an issue with the A/C midweek and it was dealt with promptly and fixed. They also referred us to Paradise Baby co. to rent a crib and baby toys. Really made the trip. This is the place to relax and enjoy the spectaular view of the beach and ocean. Every morning on the balcony for coffee and wine for sunsets. Amazing! Beautiful accommodations with easy access to the beach, pools, barbecue grills and fitness center. Would highly recommend this home! The best part of this place is the amazing view. The quality of the unit was very nice. There were some things that could be improved. The dishes and cook ware had water stains and are in need of replacement. The TV's and multimedia electronics are a bit dated. The biggest issue we had was beach access. Our unit is in the best spot on the property, however to access the beach is a walk. You have to walk all the way back to the main lobby, then walk all the way through the pool area, just to access the beach. The unit was very nice and quiet and the view was spectacular. Thank you for your comments. We are happy to hear that you enjoyed the unit and the view. Unfortunately, we are unable to do anything concerning the walk to the beach, but we appreciate your feedback on the electronics and kitchen items. We will look into these things and see if we can update them. Choose to spend your days on the Ko Olina Championship golf course or at the Marina; relax at one of four breathtaking sandy lagoons, pamper yourself at the award winning Ihilani Resort and Spa; spoil the kids at the new Au’lani Disney Resort or explore the rich culture and beauty of the Island. Enjoy breath-taking sunsets, experience an authentic Hawaiian luau, a barbeque by the pool or a relaxing evening stroll through beautiful Ko Olina. World-class restaurants and nightlife are only minutes away in the laid-back, serene atmosphere of Ko Olina – or experience all the excitement of city life with a short 30-minute drive to Honolulu. Public transportation and limousine service are both available from Ko Olina. Activities: Ko Olina Marina; 18-Hole Ted Robinson Championship Ko Olina Golf Course; Award-Winning Marriot Ihilani full service Spa, the newly opened Disney Au��lani , the Paradise Cove Luau, shopping, snorkeling, SCUBA diving, boating, fishing, sailing, surfing, windsurfing, walking and hiking paths; guided activities, including whale watching and dolphin swims as well as scenic island tours. Area: This romantic yet family-friendly resort is located just 20 to 30 minutes from Honolulu International Airport, world-famous Waikiki, downtown Honolulu, Pearl Harbor, Waikele Premium Outlets and other attractions such as Historic Ewa Town, Hawaii’s Plantation Village, and Dole Cannery. Breath-taking Hanama Bay is a 45 minute drive with Sea Life Park a short 5 minutes further. The Polynesian Cultural Center is well worth the hour’s drive and you’ll experience many traditional must-sees along the way – such as the historic surfing town of Haleiwa, and Hawaii’s infamous North Shore Beaches such as Sunset, Pipeline and Turtle Beach to name a few. The resort itself is conveniently located just 5 minutes from the newly opened Disney Au’lani Resort and the island’s best and most authentic luau - Paradise Cove, as well as Hawaiian Waters Adventure Park; Kapolei��s 16-plex movie theater, and shopping at K-Mart, Wal-Mart, Target, Safeway and Costco for souvenirs and all your needs .